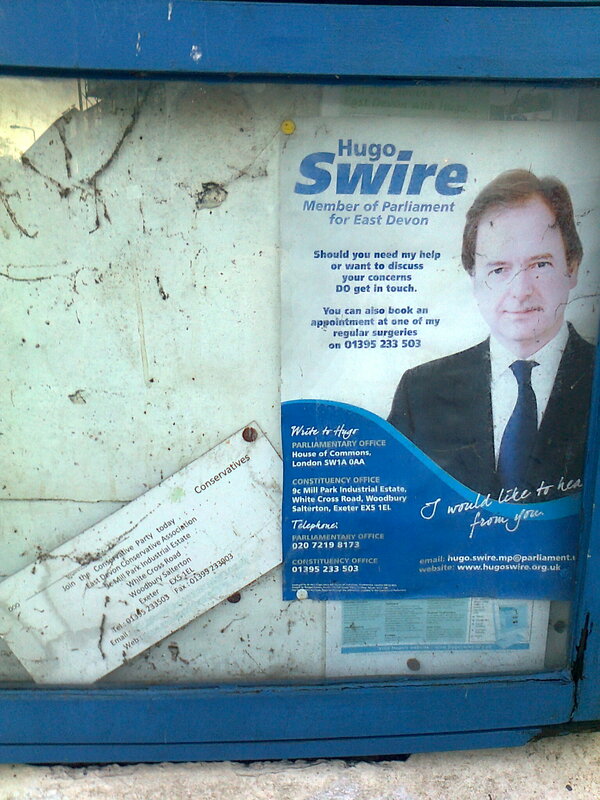 SPOTTED OUTSIDE SIDMOUTH CONSERVATIVE CLUB, THE NOTICEBOARD COVERED IN COBWEBS …..
← Cranbrook doesn’t seem to exist! As it says, everyone, he wants to hear from you … ! But will he listen and will he act? Let’s hope he has fewer cobwebs on him than his picture has! In a letter to me from Hugo Swire, dated September 20th he states ‘ It is important to note, that as a Member of Parliament and not an elected councillor, my powers when it comes to planning matters such as these are somewhat limited ‘. Enclosed was 16 pages of bumf from the Deputy Chief Executive which was freely available on the web. What came to my mind immediately was that he has washed his hands entirely of these plans, and therefore his voters, so as a lifelong conservative voter for 54 years, I will not be supporting him at the next election. Garland Pickard. Begs the question: what are constituency MPs for? No doubt Hugo is enjoying swanning around the world at our expense and meeting up with his old school mates in the Cabinet though. Can’t leave much time for Sidmouth. Same question also applies to the EDDC style of Cabinet government where 9 Tories basically make all the decisions and other councillors have no option but to go along with them. Interesting that Cornwall Council has managed to ditch its Leader because he wanted to privatise everything though. It shows what you can do when you have the will. Surely there are some councillors from Sidmouth or Exmouth who have the moral fibre to stand up and say ‘ Enough is enough ‘ From small acorns,large oak trees grow as can be seen by Cornwall County Council ejecting their leader.